Frontline 2019: Episode 3 is available for one week, on NA servers. This is your chance to participate in and experience epic 30v30 battles, win heaps of rewards, and join the race for formidable reward tanks! Wait — How Do I Access Frontline? At the Garage screen, click on "Random Battle" (to the right of the big red "Battle!" button) at the top of the screen. Select "Frontline" from the pull-down menu. 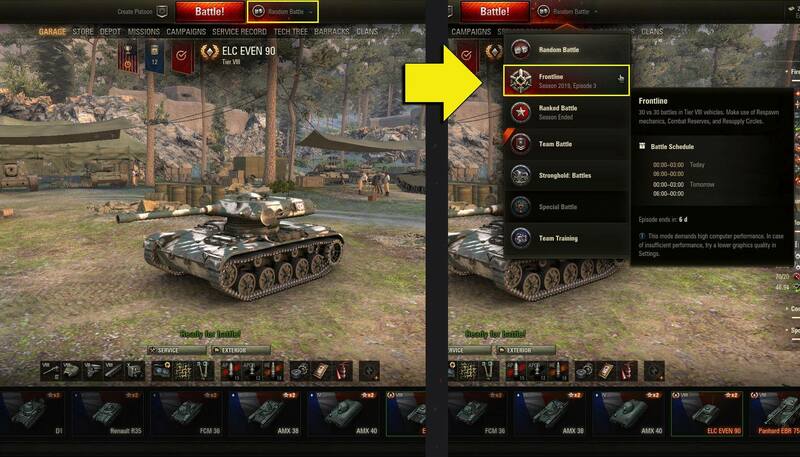 Select a Tier VIII vehicle, and then click the "Battle!" button. Choose your rewards wisely as there are not enough Prestige Points for all four! Also, we’ve got intel on Episode 4. It starts May 13 at 04:00 PT | 06:00 CT | 07:00 ET on NA servers, until May 20 at 01:00 PT | 03:00 CT | 04:00 ET. Get ready for even more epic battles! Remember — you can rent three great Tier VIII tanks for this new Frontline Episode: The Löwe, a heavy sniper, and the versatile T-54 first prototype and T-44.